The direct and indirect effects of the 2010 Olympics on Vancouver RE. 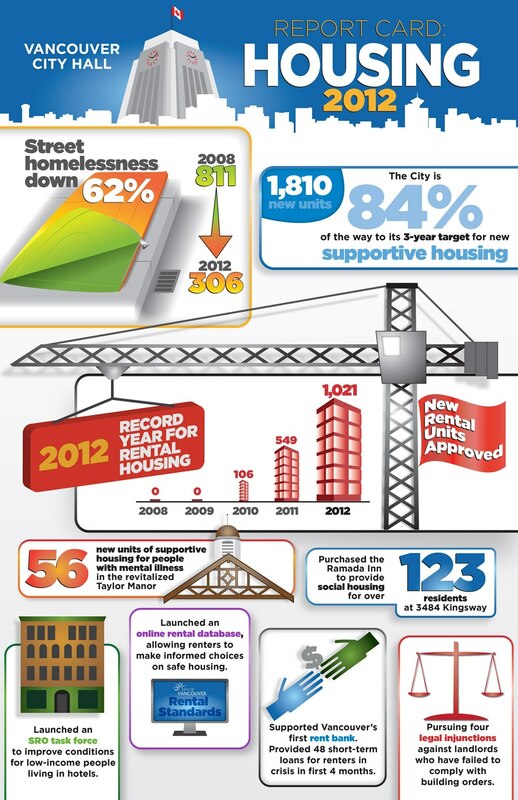 The following ‘Vancouver City Hall: Housing Report Card 2012’ appears at VanCityBuzz 8 April 2013. The cheekily truthpacked revised version below that is from a source that is as yet unknown to us (but was passed on via e-mail by ‘B’, 9 Apr 2013). Bill Good: ‘Marine Gateway’ is the first major development along the Vancouver portion of the Canada line. And 11,000 people have registered to buy one of the 414 condos that will be up for sale this weekend. It hasn’t been since ‘Woodwards’ in 2006 that a condo project has created this level of early interest. Bob Rennie, of Rennie Marketing Systems is with me in the studio. 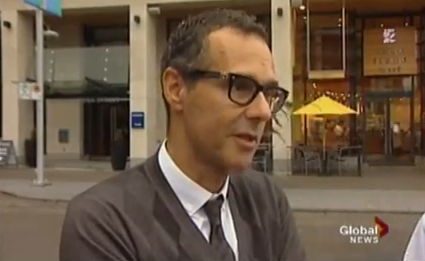 This seems.. hard to believe..
Bob Rennie: Yeah, it’s hard to believe what we go through in Vancouver, compared to almost any other jurisdiction in North America, other than Toronto. Good: And there’s a line-up as we speak? 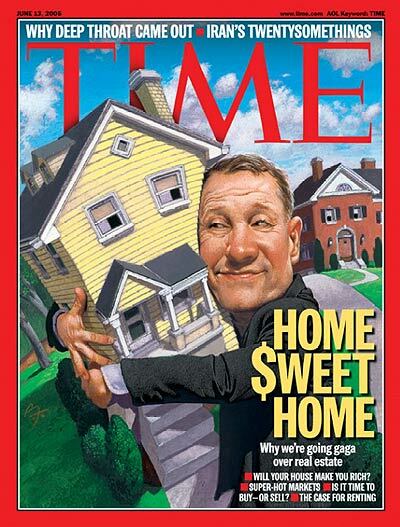 Rennie: There’s a line-up, of 60 to 100 people.. you know… everybody wants the best and the cheapest on any project, so that’s just sort of an expectation in today’s market… everybody wants the top with the views, and everybody wants the cheapest for their daughter. Good: Where exactly is this? Rennie: Right at the SE corner of Marine and Cambie, and it’s right on the Canada-Line… so you’re not going across the street, you’re just coming down and walking out… but it’s retail, and it’s office, and it’s residential, so it’s a new emerging community..
Good: What’s the price range? Good: So, under 400 thousand, and you can get on a sky-train and be downtown in 15 to 20 minutes. Good: No, she’s ahead of you… she gave up her car and walks to work..
Rennie: Jessica, and Jessica doesn’t need to drive to the local drive-in to find out what’s happening tonight, she has an iPhone, and that difference in communication, that difference in that generation, that they’re not addicted to the car the way the baby-boomer generation is.. So, as I’m telling developers, we can build without parking,.. they’re going ‘No, nobody’s going to buy without parking’.. but we’re here, so, juts over 100 units there without parking. We did the ‘Capital Residences’, downtown, the old ‘Capital Theatre’ site, with 102 units without parking… Peter Wall did the ‘Scotia Bank Centre’.. we did about 115 units there without parking. Jessica and her younger friends have no desire to own a car… not just because of the overhead but they don’t need it for lifestyle. Good: They also know that they can get a car share program, or can rent a car for a weekend, and they seem to be satisfied with that..
Good: So, you’re seeing a real transformation..
Rennie: Absolutely.. I think this year we’ll bring out 1800 to 2000 homes transportation oriented.. so Marine Gateway, and then we’re doing at Boundary we’re doing 3 towers later in the Fall, and then we’re just going to start previewing in Richmond, ‘The Mandarin’, which is the very first Canada-Line station. Not only that, you’ve got a million square feet of shopping and restaurants. Somebody told me, if you’re going to buy in New York, find an area that’s the least inconvenient to your lifestyle, not the most convenient, but the least inconvenient… so the fact that you’ve got restaurant shopping, dry-cleaners, not just a telephone store, but real usage downstairs.. and the transportation is the big win. Rennie: The cost of parking but the inconvenience now of being in a car driving down Hornby, or driving down Granville, where do I turn right or where do I turn left?.. and if you hit the wrong time, you’re in your car for 20 minutes, as opposed to being on the Canada line, on your laptop, on your iPhone, and just walking 5 minutes. 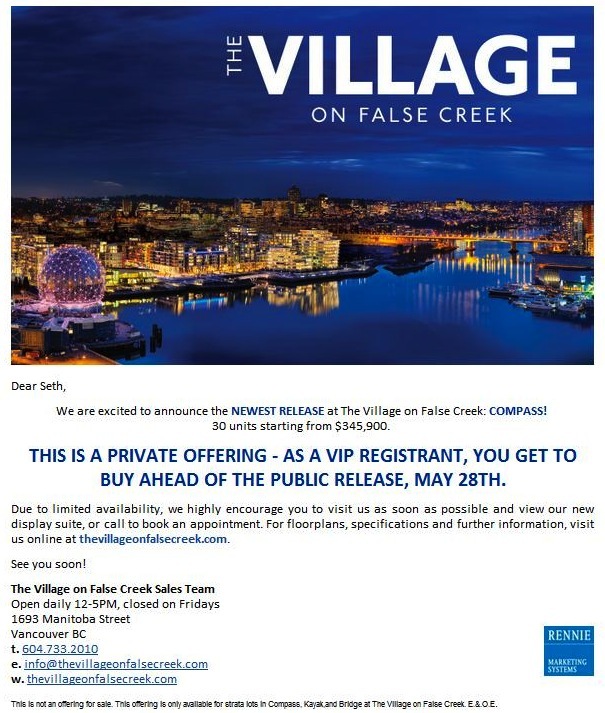 So, this under 35 and over 45, there’s sort of purgatory inbetween there… the different ways that we look at the vehicle..
Good: You think you’ll come close to selling out the 400+ condos, in a weekend? Good: You just told me you gave up your big fancy car, for a Prius… Are you trying to move into a generation below you? Good: And you actually drive yourself?.. Rennie: The company has a Mercedes hybrid, that my assistant, Sylvia, stays with me 7 to 7, ‘cos all my business is running from boardroom to boardroom, from developer to developer in the downtown, and, when you look at driving and you look at parking, it’s just.. I like my assistant with me… so she stays until 7 o’clock and then, after that, I’ve got my Prius, I love it..
Rennie: We’re building all our new developments on affordability – Jessica -, and then, the baby boomer – Bill and Bob – and, you know, this baby-boomer generation, which is 47 to 66 years old, they don’t have as much money to play with as they thought they had, they’re not taking the risks that they used to take..
Good: The baby-boomer, I suspect, is thinking of driving less.. perhaps having one car instead of two..
Good: This is the high end. Rennie: This is the high end… front-row seats right on the sea-wall.. starting tomorrow, Saturday, for two weeks it’s open to the public, after that it’s by appointment… You know, this one million to seven million dollar inventory really isn’t an open-house inventory.. but there’s a lot of real estate sport condo watchers and Olympic Village condo watchers, and where did Sidney Crosby speak condo watchers.. sleep.. condo watchers that’s where our Olympic team stayed was in Canada (House)..
Good: So where is the market for that.. is that a local market.. off-shore market, or both..
Rennie: it… we can tongue-in-cheek say it’s not.. it’s not off-shore… it is a local market..
Rennie: People downsizing.. they’re selling their West-side homes and they’re repatriating that money.. which is breathtaking (laughs).. to other jurisdictions, such as the Olympic Village. And, the Olympic Village, I needed 2.5 to 3 years to sell it, stabilize it, and earn the brand back.. when we bring on a Marine gateway, you go down, you put 10% down, and within a year you’ll have a 25% deposit and 33 months from now you’ll pay for it. So Bill and Georgie can figure out do we need it to live in?, do we put the kids in it?, are we going to spend more and more time on the coast?, do we just keep it as a passive investment? Good: He’s trying to sell me! Rennie: ..but I can’t get you ahead of the line!.. But you’ve got that 33 months to figure it out… But if you buy at the Olympic Village, within 60 days I want all your money. So you have to have been selling your home or selling your home (sic). Stats, if you’d like them, Bill, is that 69% of all homes sold in Greater Vancouver, are to people that already own a home. The other 31% are to first time buyers. 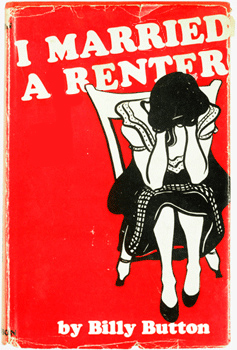 Good: So there’s still a first time buyer market? Good: There has to be.. doesn’t there? Rennie: But I think the deception, after my recent address, putting the numbers together.. I think the part we have to understand, is that this first time buyer, when we say we’re the most expensive place to live, is based on incomes, but the 69% of buyers already own a home, it’s an equity play, they’re just trading baseball cards.. But the 31%, I’m trying to understand.. so, I’m putting the figures together.. of the over 55 year population that owns their homes clear title, and that 55 to 74 year old, when they’re selling their home, they’re helping the kids and the grand-children… they’ve… (my stats guys) and I were joking the other day that we’re gonna make t-shirts that say “My grandparents bought a home in 1978, and alls I got was a lousy one bedroom condominium”… because that money is being repatriated down to help the kids..
Good: OK, we’re almost out of time.. Transcribed here, for the record. -ed. “BC No Longer Calls Self ‘Best Place on Earth’. The “Best Place on Earth” and the sunshine-and-mountains logo (is it setting or rising? ), was launched in 2005 and registered with Industry Canada’s Canadian Intellectual Property Office the following year. It appeared on ICBC’s Vancouver 2010 Winter Olympics licence plates in 2007, replacing the traditional “Beautiful” above a photograph of Mount Garibaldi and the VANOC inukshuk logo. But something funny happened on the way to the biggest show on Earth. When Campbell put on his salesman-in-chief hat and attended the Beijing Olympics in 2008, he called British Columbia “Canada’s Pacific Gateway” instead of the “Best Place on Earth.” With a pinch of sarcasm, I asked him, why? If B.C. is really the best place anywhere, why not tell the world? Jobs, Tourism and Innovation minister Pat Bell offered few hints about the slogan’s fate when he was grilled by NDP critic Spencer Chandra Herbert in a May 5 budget estimates debate. “Yes, I am proud of the province and I think it’s the best place on earth, but it was probably not the best way to attract people from other parts of the world who think their little section of the world was the best place on earth,” Chandra Herbert said to Bell. “I’m just wondering: is ‘best place on earth’ shelved for now, and we’re now not going to see that anymore, and we’ll see ‘Super, natural B.C.’ in its place? Since Premier Christy Clark’s March swearing-in, the bold advertising slogan of the Gordon Campbell era has slowly and quietly disappeared from government websites and letterhead. You can still find it if you look, but blink and it could be gone. The decision, I am told, was not even of the “back-of-the-napkin” variety, because no scrap of paper was used to record it. So, now we understand. We have always been puzzled by the claim, this explains all. So, citizens of BC, how does it feel to have been treated all these years like children; like the second to last team in the local Under-7 hockey league? The real problem is that many folks lapped it up. And, relevant to us here, it helped push them to reach for that much more debt, so they could overextend even further to buy that much more unaffordable ‘BPOE’ real estate. “My initial reaction is ‘hurray,'” said Peter Williams, director of Simon Fraser University’s Centre for Tourism Policy and Research, about the slogan’s demise. “Canada Starts Here” is also the brand used in the marketing of Clark’s new jobs strategy. Voice over: Tuesday Bob Rennie launches the sale of the section called ‘Sails’… Bigger units, bigger views, bigger prices… from half a million up to two million dollars. Reporter: How do you go about doing something like this when there is such financial turmoil? 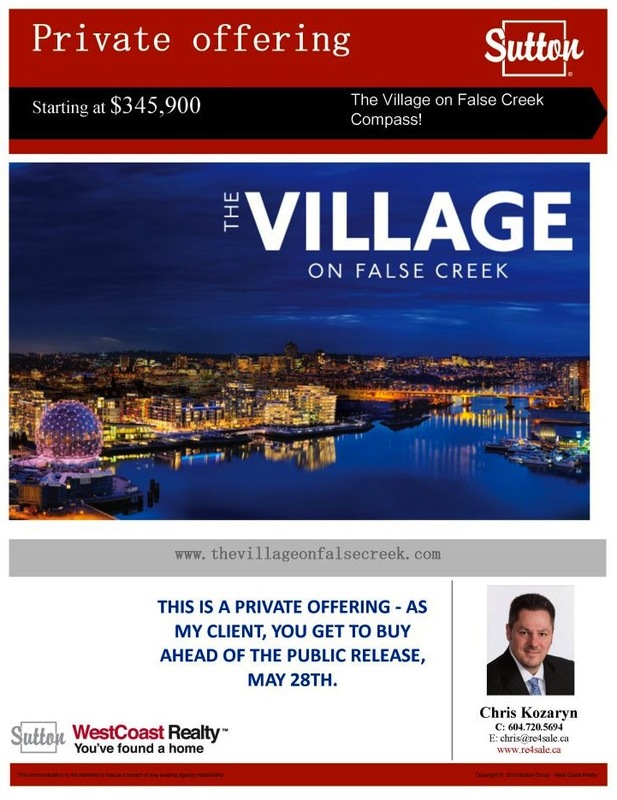 Rennie: You know… we can start… we’re talking about the asset called ‘The Village’, but the broader asset is Vancouver… If you want to take money out of volatile markets, Vancouver is looked at as a very safe place to put money. People are poor at assessing ‘safety’ when it comes to investments. Assets that have shown apparent strength because of massive speculative momentum, are actually the least-safe place to attempt to invest. Vancouver RE will look safe until it doesn’t, and demand will then quickly disappear. We’ll find out what it’s like to participate in the downside of volatility. Steaks will once again become steaks. 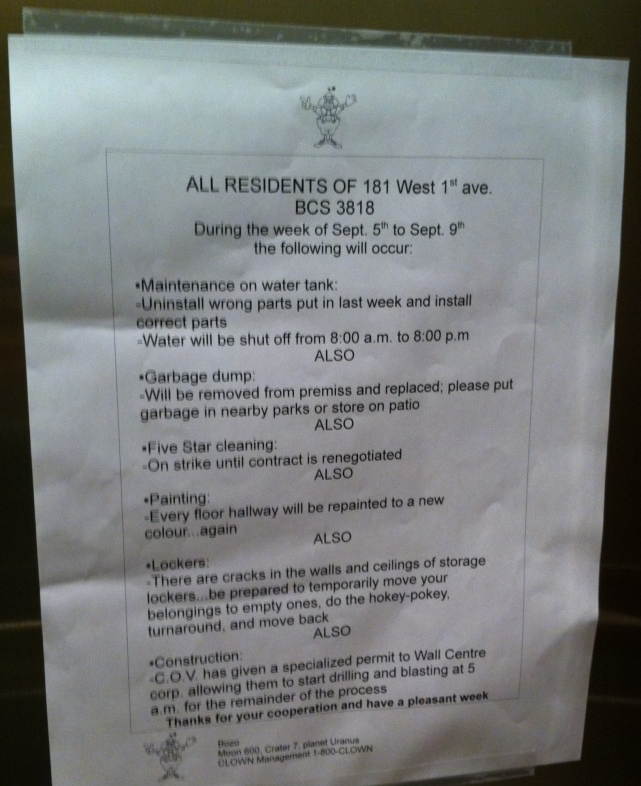 – Seen posted in one of the Olympic Village buildings. Photo from ‘zerodown’, via e-mail to VREAA, 6 Sep 2011. “There are 30 units to be released in the Compass building. They will be pre-sold prior to being made available to the public on May 28th. Yes, you and that small intimate band of close friends who read craigslist, can ‘purchase before everybody else’. This is the attempt at creation of a ‘virtual line-up’ for this product, in the hope that a buzz ensues. In actual fact, anybody with the money can have one, guaranteed. Or, more to the point, anybody with the loan. There will never ever be a shortage of condos in Vancouver. Never. Ever. Fly into Hong Kong, look out the window. Fly into Vancouver, look out the window (“I am visiting rural farmlands?”).